"Manage NASA strategy and budget. Work with the Office of Management and Budget on federal research and development investments. Deal with climate change, both in terms of mitigating it and diffusing the controversy. Testify before Congress. Oversee the National Science Foundation. Execute whatever the classified work on national security and homeland security might be. Forge science and technology cooperation agreements with nations like Brazil, China, India, Russia, and Korea. Support the State Department on other science-related initiatives. Put the president in contact with top outside experts when necessary. All in all, (Obama Science Adviser John) Holdren worked in approximately 70 different science fields at any given time." - writes Brian Palmer on Slate. Even when the office was demoted, under George W. Bush, the WHSA - Jack Marburger - was a prestigious scientist who remained in a science-unfriendly administration because of crucial roles in the National Security Council -- roles that are now, under science-hating Donald Trump, deliberately left unfilled. Now look again at my recent posting about the fellow who was Trump's top candidate for the Science Adviser role - David Gelernter - and see how this whole thing just gets weirder and weirder. Seriously. Marching and chanting are among the least effective things we can do. But they are at least a bit effective and they take the least effort and can get our blood up for this fight to save civilization. Be out there on Saturday. If you can't make it to the DC March, there are over 500 marches, worldwide. Even if just alone on a streetcorner with a sign: SUPPORT A SCIENTIFIC NATION. Ray Kurzweil, one of the principal thinkers regarding the Singularity, encourages lively debate about how to make the coming transformation a friendly one. His popular website has published one of my essays - Preparing for Our Post-human Future - about this very matter: how we can teach "ethics" to the looming Artificial Intelligences... and whether ethics is even the right tactic to try. While reviewing several recent books on AI, I ask whether more might be achieved using a different set of tools. What will happen as...Our computers learn to code themselves? For more on how we will incorporate robots and AI into our lives, see Novum's latest podcast exploring Robots, Asimov, and... avoiding the Robot Uprising. We need to rethink the mechanics of how we think. For a century, the neuron was thought to be the active element, turning on and off like a switch. Then the many synapses that flash between neurons seemed to resemble circuit elements in our computers. Now we realize that dendrites make up more than 90 percent of neural tissue. Dendrites are the pickups that receive input from synapses, and they vastly outnumber the axons that deliver that input. Now it appears that dendrites engage in substantial internal information processing, far more than is done in the soma, or main body of the neuron. “What we found indicates that such decisions are made in the dendrites far more often than in the cell body, and that such computations are not just digital, but also analog,” one researcher said. On the other hand, it makes the Human Leap Forward all the more amazing. This has long been a red line that worried ethicists. Indeed, it’s why Robert Heinlein may be best remembered, a century from now, for the clever solution he recommends in his novel Beyond This Horizon, how to deal with the moral quandaries of genetic engineering — what’s now called the “Heinlein Solution” — allowing couples to select which naturally produced sperm and ova they want to combine into a child, but forbidding them to actually alter the natural human genome. It is a notion so insightful that biologists 40 years later have only recently started to discuss what may turn out to be Heinlein’s principal source of fame, centuries from now. A more pragmatic concern driving the committee was the likelihood that the technology would be adopted elsewhere, in countries like China, where some pioneering research on editing human embryos — without the intent to gestate them — has already taken place. “If we have an absolute prohibition in the United States with this technology advancing, it’s not like it won’t happen,” said R. Alta Charo, a bioethicist at the University of Wisconsin, Madison, and the committee’s other leader. Many European countries that have signed a treaty to refrain from human germ line editing. A UCSD anthropologist has recently asserted that our ability to persist in a belief despite evidence may be the reason humanity launched to high levels of intelligence – because only denial would let us endure the obvious futility of life and the looming inevitability of death. Denial: Self-Deception, False Beliefs and the Origins of the Human Mind, by Ajit Varki and Danny Brower. I do not believe this theory by the way; I have my own explanations for the human launch to sapience, as I discuss in Human Neoteny and Two-way Sexual Selection. Oh, I avow that delusion is the greatest human talent. Even here and now, in the most scientific and fact-centered civilization of all time, we are awash in subjectivity and made-up narratives. Even scientists - trained to utter the sacred phrase: "I might be wrong" and to seek their own mistakes - only catch some of them. For the rest, we rely on the greatest of all human inventions: reciprocal accountability through criticism. In which others, who don't share your particular delusions, can point them out for you... and boy will you eagerly return the favor! 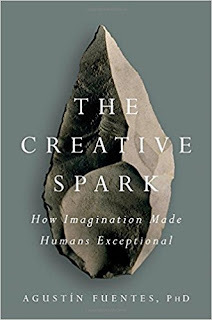 Meanwhile, another exploration for the evolution of human intelligence and creativity is offered in: The Creative Spark: How Imagination Made Humans Exceptional by anthropologist Agustín Fuentes, drawing upon archeological and genetic evidence to pinpoint the roots of the spark that ignited the human mind. In both Earth and Existence I speculated about resurrecting extinct species, like mammoths and Neanderthals. Now the Mammoth project is looking closer at-hand. And I am involved in an endeavor to grow Neanderthal brain organelles and fly them… in space. Google’s parent company, Alphabet, announces that its subsidiary Jigsaw (Google Ideas) is developing a machine learning technology - Perspective - that will promote more civil discourse on the internet and make comment sections on sites a little less awful, by helping web publishers to identify toxic comments that can undermine a civil exchange of ideas. Ultra-thin temporary electronic tattoos can now turn body blemishes into touch-sensitive buttons, letting you control your smartphone with a stroke or a touch. A biofoam, laid across dirty or salty water, can use sunlight to separate out clear water. As Earth Day approaches, you might be interested in a passionate essayist’sshort piece on ideology, science, politics and sustainability. Okay, get out there and do something to defend the only real chance at civilization against barbarians from without... and within.